Entries from Digital Intelligence tagged with "rakuten"
Online retailer Play.com has claimed that its Facebook fans are worth 24% more in direct sales than non-fans. The announcement comes amid growing questions from brand managers across the world seeking to quantify the elusive “value of a like” on Facebook. The online retailer, which is owned by Japanese digital firm Rakuten, also claims that it can directly attribute £2m worth of sales to Facebook in 2011. Direct sales through the social network have increased 80% in the past year. Brits, Americans and Germans beat Monday blues with e-tail therapy; Brazilians most likely to shop online at work, while the French soothe stresses of childcare with some internet shopping, according to new research looking into online shopping trends around the world. Online retailer Rakuten used data mined from traffic and sales through its global online marketplaces (including Play.com in the UK), to look at how local differences shape the online shopping habits of consumers across the globe. Japanese ecommerce giant Rakuten has acquired Spanish streaming and video on demand business, Wuaki.tv. Wuaki.tv offers premium content over the Internet directly to Smart TVs. The acquisition will see Rakuten further extend its global reach as it enters the Spanish market for the first time. Social media ‘pinboard’ Pinterest has won $100m (£63m) in funding from Japanese internet retailing giant Rakuten and existing investors. Rakuten, one of the world’s top 10 internet companies, said the money would be used to improve Pinterest's service and expand its user base. Online retailer Play.com is considering the introduction of a payment-on-delivery offer for its customers, according to a news report. Retail Week reports that the service is commonplace in Japan, and the site’s new Japanese owners Rakuten are keen to make Play.com the first to offer it in the UK. The idea is to attract customers who are uneasy about the notion of paying online. Japanese company Rakuten has bought UK online retail giant Play.com for £25m. Play.com is one of the largest ecommerce firms in the UK, selling music, books, clothes and electronics to over 14 million registered users. The company said the purchase marked a "significant step" in its continued European and global expansion. In terms of retailers, Amazon sites reached the largest global audience with more than 282 million visitors in June, or 20.4% of the worldwide Internet population, according to new research. 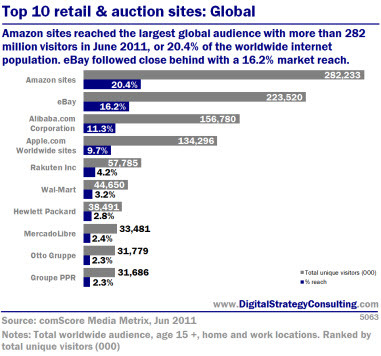 The study, from comScore, found other top brands included eBay, which reached 16.2 percent of global Internet visitors, China’s Alibaba.com Corporation (11.3 percent reach), Apple.com Worldwide Sites (9.7 percent reach) and Japan’s Rakuten Inc. (4.2 percent reach).